The most offbeat and longest-running musical project of my career(!) was with the New York Novelty Rock band, Cab City Combo. Although we’ve never actually broken up, it’s been years since anything new has been recorded and released. The Combo was the brainchild of Paul Rubin and over the years many friends and acquaintances played sessions with the band. The project was strictly a recording affair; no gigs were ever played and for that reason I always looked at the group (especially in the early days) as if it were The Beatles during the Magical Mystery Tour period. Cab City didn’t have to concern itself with the limitations of the stage and was therefore able to use people, instruments, noises, and studio tricks that worked as a one-off in the studio, but would’ve been hard to reproduce live. Unlike many of my other musical projects I was restrained by a guy functioning as the producer of his own music so I had to come up with cool little parts and riffs (if they weren’t already part of the song) and function as part of an ensemble. It was a continuously fun and interesting challenge and I’m ALL about the challenge! It also afforded more trips to the recording studio and I’ve have always LOVED being in the studio. I can’t remember ever having a bad time recording back in those days. We were lucky because we worked with 3 very sympathetic engineers over the span of our career: Jim Fourniadis, Greg Talenfeld, and Gary Knox. They always went the extra mile to indulge Paul’s whims and offered invaluable assistance to get the production to really POP. It certainly helped that they are all boss musicians in addition to being studio wizards. Jim was actually a member of the Combo for the first couple of sessions. When I was a kid, The Dr. Demento show was on the radio every Sunday night and for 2-3 hours he would play a dazzling assortment of weird and funny stuff. (Kind of sounds like 1930s but we’re talking early 70s) I used to do homework while well-known, goofy gems like They’re Coming to Take Me Away, Transfusion, Lil Red Riding Hood and Shaving Cream, the song that won many of the top 10 countdowns on the show in those days, played in the background. I think the family bought 1 or 2 KTEL novelty compilations but I don’t remember them getting a lot of attention. Not only was I also discovering rock and roll and more interested in that, but there was something cool about hearing the funny stuff in the context of a radio format. The songs seemed to lose some of their zip on an LP because I knew what was coming. I didn’t think about the whole concept of Novelty again until the early 90s when I was asked by friends if I wanted to play guitar in the Cab City project. I didn’t know Paul at that point, but we did the first session and it was a whole lot of fun. Since Paul was doing Novelty Rock I didn’t think of it as a huge departure from what any of us were playing anyhow and historically this has always been true. Sam the Sham and the Pharohs are considered by many to be a fine rock n’ roll band as are a host of other bands who recorded songs that are considered novelty-esque, like The Champs with Tequila and The Kingsmen with Louie Louie. 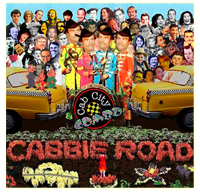 Cab City was kind of carrying on in the same tradition, but Paul’s influences included people like Martin Mull, The Bonzo Dog Band, Frank Zappa, Steve Martin and other twisted luminaries from the 1970s, while Cab City was always a Novelty Project, that definition could be pretty broad at times. Even though the line-up changed for the next session a year or two later, I stayed on and kept doing it…for eleven years. Paul and I had a pretty good working relationship and as time went on our approach to the project changed to something more like Tommy Tedesco or The Wrecking Crew because Rotgutter, the power trio band I was in at the time, became the core of Cab City. As a band we were already super-tight and that allowed all of the Combo recordings to proceed very quickly and smoothly. Dr. Demento actually played the Combo on his show a few times and Paul had a map going on how many people in how many of the US states bought the CDs. 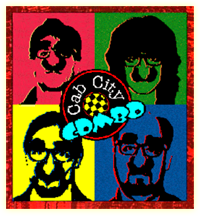 While Cab City was never a threat to Weird Al‘s popularity, it was a nice little project and over the years I was able to put down some really cool and varied guitar on a wide range of music. The sessions were totally fun and part of an era that is rapidly disappearing. Today musicians can avoid recording studios and put their music together on laptops and hardly anyone works with tape. Most of the studios we recorded in over the years are gone now, but it was always an education and a blast to be in that environment putting a project together with like-minded people and friends. The Combo did get some love over the years, including a nice letter and encouragement from Jello Biafra, punk icon and leader of the Dead Kennedys. Because there was always a veneer of punk rock music and sensibilities in Cab City I was convinced that Paul had aspirations to be a punk rock star! Because most of the musicians in the Combo were capable and comfortable doing that and because punk rock is usually humorously irreverent, the combination worked and it appealed to fans of both styles of music. Even when the music didn’t sound like punk, there was usually a twisted, misanthropic attitude to the lyrics that sounded like PUNK ROCK or NEW YORK. The SUV Song is a good example — musically it’s such a pleasant-sounding song and I was going for a very Caribbean guitar thing. Lyrically it was a different story and that juxtaposition and the sing-a-long chorus made it one of the Combo’s more accessible numbers. Two kids in England liked it so much they made a video for the song. Some of my other favorite Cab City tracks in the above player illustrate the range of different styles involved in the band and what I did guitar-wise. Paul wasn’t a taskmaster by any stretch of the imagination; he actually let the band have quite a bit of room to come up with their own stuff. But he did have certain ideas about what he wanted and didn’t like. This kind of relationship was good for me as it always forced me to focus and try to see outside my own musical parameters. All of the musicians involved had played with each other in some capacity or knew each other so that made it easy to get the music together and record it quickly. Songs like Monkey King, High Entropy and Insulin were pretty close to being POP numbers. Monkey King always felt like a Broadway show tune meets the aforementioned Beatles Magical Mystery Tour-era to me, I don’t know why. Insulin has a phased kind of George Harrison/Eric Clapton “Badge” era thing going on and I do remember Paul having a lot of input into how that solo sounded. What’s funny is that although I was playing through an MXR Phase 90, I didn’t have it turned on, but it sounds like it was. I’m also playing a Rickenbacker 6-string for the strumming part, which is the only time I’ve ever used a Rickenbacker guitar in my life. I’ve never owned one and the one I used (which was really boss!) belonged to the guy who owned the studio. After You Alphonse, which is the comedy gag of more than 1 person trying to get through the door simultaneously, is probably Cab City’s most obvious punk number. Less than a minute long, the guitar approach is: Just PLAY FAST. High Entropy reminds me of Chris Spedding and the couple of years of hanging out with him certainly influenced the cool, laid back riffing on this song, which was sung by Marti J. Cooney, a lady who contributed many fine vocalizations to the Combo over the years. So did Laurie Kilmartin and Maddie Horstman, who does the lead vocals on the next song, Santa Klutz, which was typical of the goofy fun we had making these songs. 4 of us huffed helium out of balloons to make the elf voices and I can still remember us standing around the mic trying to get it right without making each other crack up. Same was true of Lake Pennsylvania, which was a real biatch to record, especially THE SINGING NIXONS vocal parts. The music was real easy and there was also a steel drum added by Jamila Cowie. Cab City usually had special guests come in and contribute and they always performed well. Banned by the Man was surely one of the finest guitar moments of my Novelty career. I took Jimmy Page’s DADGAD tuning and used it on an acoustic and couple of electrics to create an Indo/Persian feel for Paul’s rant on copyright laws. Since The Beatles figure heavily in the rant, I felt that the almost sitar-esque quality of the music worked well. I forget if we planned that or not. I also played bass on the track and used an Echoplex to get the delay/echo effect. Later on I developed this piece further and I think it will show up in it’s entirety on this blog someday. If you wish you can download other CAB CITY stuff HERE. 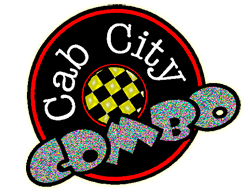 Cab City Combo released two full-length CDs; compilations of all of the sessions we did over the years and they are STILL FOR SALE! It’s interesting how during the band’s career and since it was shelved, so much of the music business and New York City has changed. In that way listening to these songs for me is a snapshot of a special time in my life. I’m not a fan of any modern novelty music and probably never will be and the fact that I wasn’t a fan even when we were recording allowed me the freedom to just come up with ideas that would fit the songs and vision Paul was trying to put across. All of the other people involved in the core band over the years were total pros, and many are still involved in the music business in some capacity. My first attempt at a jazz song occurred with the Combo and it’s kind of funny that is where I am now — playing music that I originally did as a parody for a Novelty band. The Combo’s parody stuff was really brilliant and someday maybe it will find it’s way on here. If you want to know why it isn’t, listen to Banned By the Man. Perhaps the Combo will do another session in the future, but even if it doesn’t, there is a bunch of great stuff I was happy to be a part of and am pleasantly surprised when I hear it now. I’m not one of those people who dwells on the past or listens to all the music I’ve done on a regular basis, but every once it awhile it’s a nice trip down memory lane and a way of measuring where I am, where I’ve been, and where I’m going.